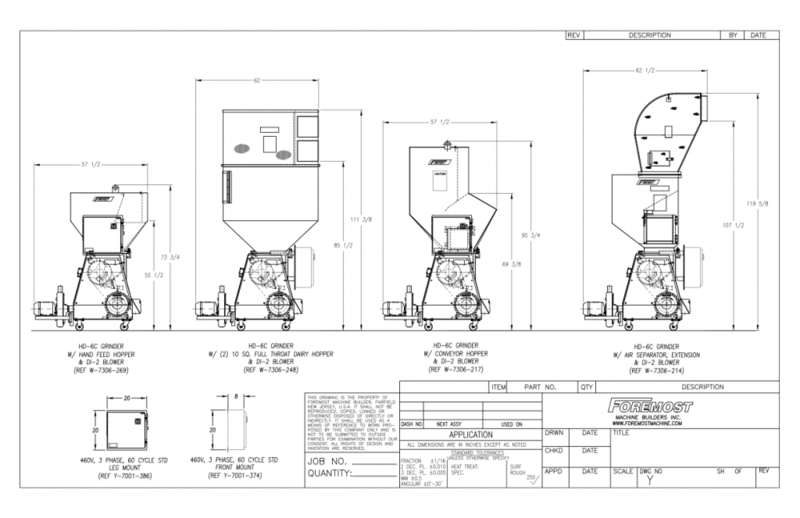 Heavy Duty Granulators HD-6C – Foremost Machine Builders, Inc. The HD-6C is specifically designed to reduce dust and fines. Granulators naturally produce dust, especially with dull knives and improper knife gap. Dust is greatly reduced with the HD-6C. A three-bladed rotor is used to “shear” material instead of “take a bite” out of the material. The dairy package of this model is especially popular. HANDFEED HOPPER: (W-SK-7306-189-1) Heavy duty 7 ga. Hopper features are robust mounting flange, steel framed cleanout door with safety switch and curtain to prevent material flyback. DAIRY HOPPER II: (W-SK-7306-10) Full throat discharge hopper, circular split hopper, access door, dual baffles, constructed of heavy duty sheet and flattened expanded metal. (2) 10” inlets standard. CONVEYOR HOPPER: (W-7306-195) Heavy gauge alloy steel, welded construction. Hopper features are robust mounting flange, steel framed cleanout door with safety switch, and vinyl curtain to prevent material kick back. This hopper has an angled conveyor shelf for mounting a feed conveyor to the grinder. AIR SEPARATOR: (W-5007-107) Select inlet from next page. Heavy duty perforated steel hopper with inlet mounting plate and cleanout doors. Must be mounted to the hand feed hopper or the air separator extension. Standard is (2) 10″ square. AIR SEPARATOR EXTENSION: (W-SK-7306-130) Heavy duty 7 ga. Hopper features are robust mounting flange, steel framed cleanout door with safety switch. Baffle to prevent material flyback. For regrind discharge. Other sizes are available. Extensions available to change height of grinder. 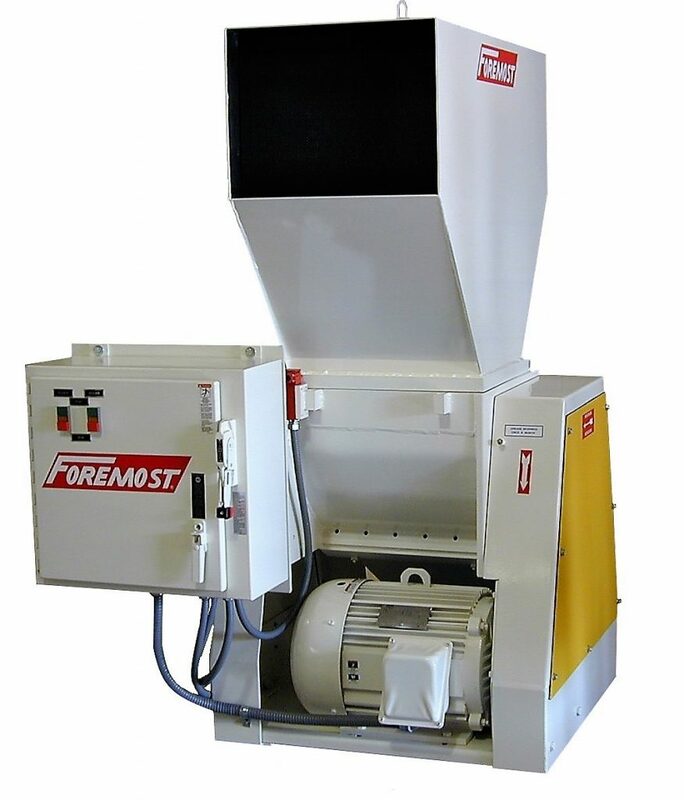 Talk to a sales representative about ways to mount the control panel on or around the grinder. The air separator hopper is available with multiple inlet arrangements as listed below. Square 12” Square 10” Outer Dia. 11” Outer Dia. 11 ½ Inner Dia. 12” Outer Dia.